A few days ago, my cousin spearheaded the family's participation to the annual trick or treat of the village. This is the second straight year we're participating and I'm looking forward doing this over the next years. I'll let the photos relate everything. The semester break is only a week away! Classes are over but I still have one more task to accomplish tomorrow ... encoding of grades. Tomorrow is our deadline and before I finally welcome the much needed break, I still have one project due before the almost week long break. Before I finally convert to vacation mode, let me recount the few beautiful things that made my past week. I was asked to report in Makati before weekend. Whenever I visit the place, I make it a point to meet my dearest friend A. 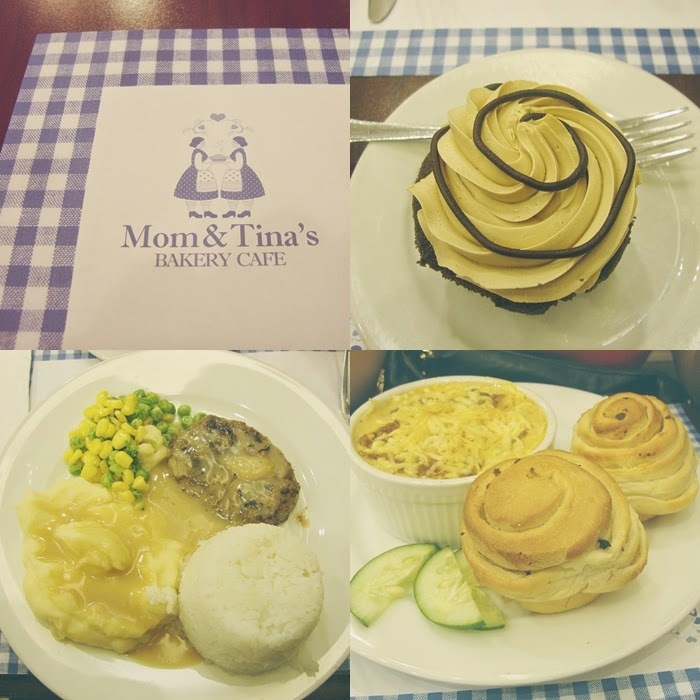 We explored Landmark and Glorietta, the two malls I rarely see.We also passed by the intimidating but lovely Greenbelt ;) After a long day, we finally got to try Mom & Tina's. The food was great and I'm willing to visit again. I only have one complain though. Customer service is not that great. I will not detail the incident but hopefully when we come back, we will have a better experience. Meet my new toy!! - This is another great product that is unfortunately delivered by very poor customer service. I scored this old school camera through Lazada Online Shopping. Lazada is great in terms of prices and product diversity. It unfortunately fails on one important aspect of online shopping; product delivery on time. I'll share this in another post. One of my favorite fruits is in season again - I swear, I can finish an entire tub by myself. 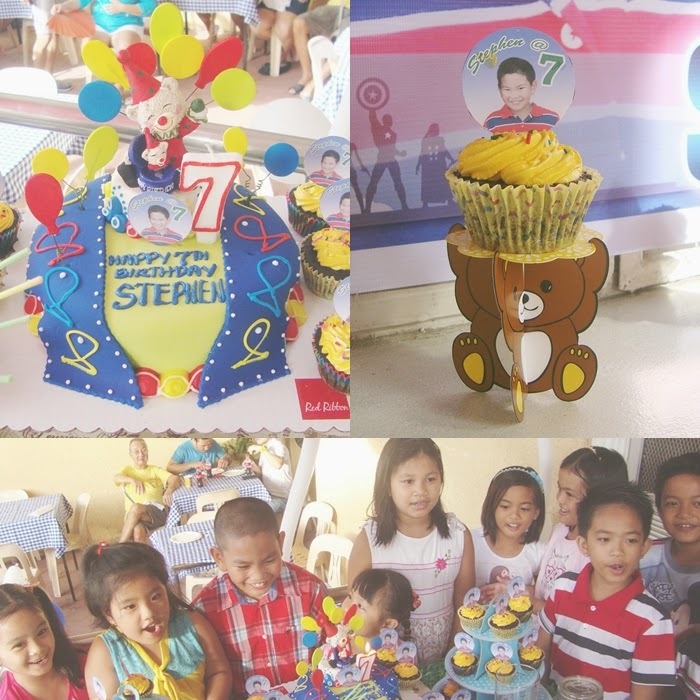 Almost a week ago, we celebrated the 7th birthday of another kid in the family. Can I just say that kids today are luckier?! The fondant cake is very ideal in the always summer temperature in Manila. The icing remains in the same condition throughout the entire party. We never had cupcakes with frosted icing back then. There's candy buffet and other unique treats that never fail to surprise me. I never had plans of shopping in Lazada. I heard and read all the negative reviews from quite a number of bloggers. My business partner for our candy buffet business also had her own patience testing experience. Most of the negative experiences I encountered, including that of my business partner, centered to one problem: late delivery of the items. I was convinced to never try Lazada. Everything changed when my I saw my dear friend T's Fuijifilm Instax 7 Camera. T purchased her camera through a deal from Ensogo. T had the camera years ago and for sure, Ensogo is no longer offering it. I searched for other local shops that offer the camera for a good deal. My prayers were answered because I landed to Lazada's Philippine site. Best about everything, the camera is also offered at a discounted price. So as expected, my shopaholic hormones gave in. I purchased the camera last October 14. 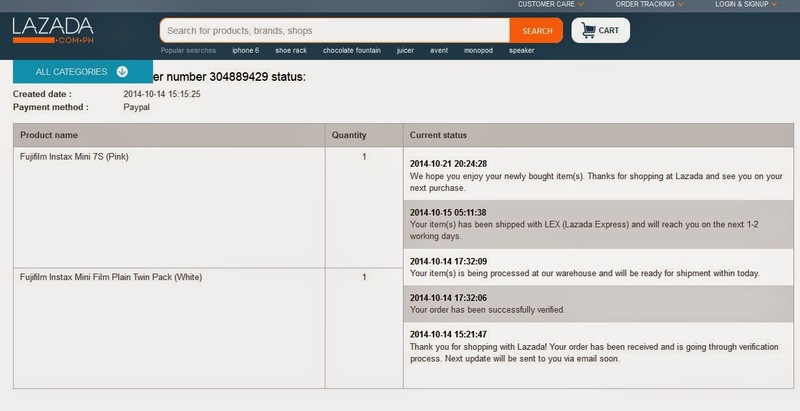 Terms and conditions from Lazada stated that they deliver within 3 to 5 working days. Although personally, I find their timeframe too long. Following this policy, I should receive my item by October 21, 2014. I don't have complaints with this timeframe. 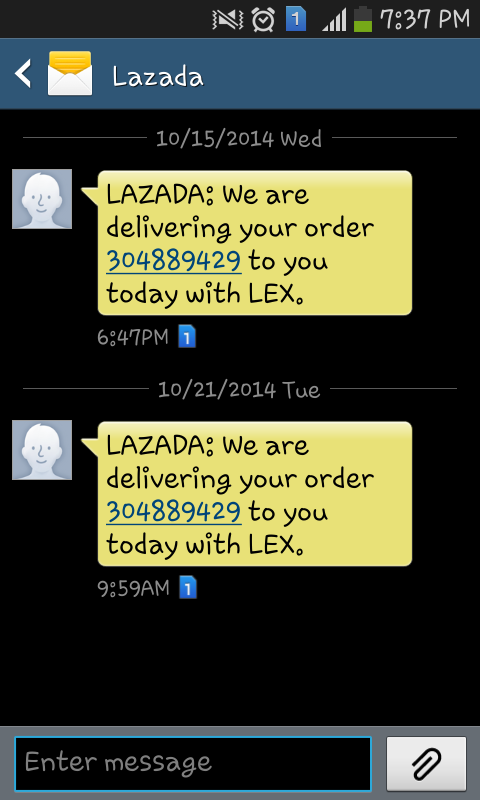 The frustrating and disappointing experience started when Lazada sent me the series of confirmatory emails. I posted my order and it was confirmed on the same date. I received a notification via email that my order is set to arrive over the next two days. This means that I should expect my package on October 17, 2014 or Friday. I received a text message that my order will be delivered in the afternoon. I thought this will be good news. The day ended but no signs of delivery. It was already 5 pm at the workplace. No signs of arrival so I made a follow up call. Sadly, the phone call emerged as a futile attempt. The Customer Service Representative documented my concern but no confirmation as to when I should receive my item. No signs of the package. No packaged yet. Made a follow up call that ended as another futile attempt. I made a follow up call in the morning. The Customer Service Representative did not give any guarantee or specific time and date of arrival. He reasoned that the courier's services is way beyond their control. The resolution given to me, the item will be redelivered tomorrow. This is already very unforgivable . I demanded that if my item will not be delivered today, I will already seek for refund. I got this template-ish text message again. Around 4 pm, the item finally arrived. IT TOOK LAZADA A WEEK TO DELIVER MY ORDER, considering that my shipping address is in Manila. Can I just say that Lazada is way inferior than Zalora? Considering that my shipping address is situated in the business district of Manila, I cannot understand why it would take them a week to deliver my item. A suggestion to Lazada's management: please improve and benchmark from Zalora's operations and logistics. Lazada's courier and operations area have very weak and poor coordination. Every Customer Service Representative I spoke with cannot give me definite answers. This is just so frustrating. 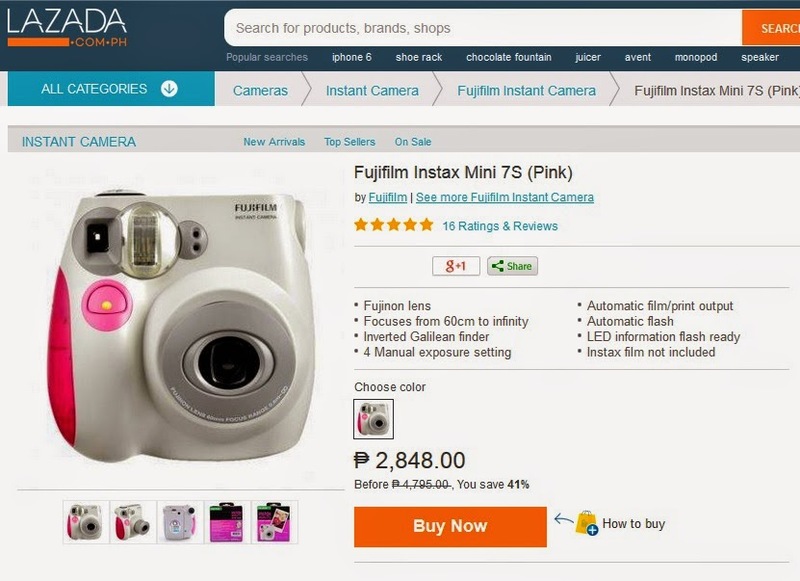 Lazada has an extensive collection of items offered at relatively cheaper prices. As much as I want to re-order from them again, the very poor customer service and slow delivery become the trade-off of their cheaper prices. It makes me think that Lazada's cheaper prices are not worth the stress and patience. My only consolation, the camera comes with free batteries (which I hope would last for a long time) and I'm praying that the item will not have any defects. 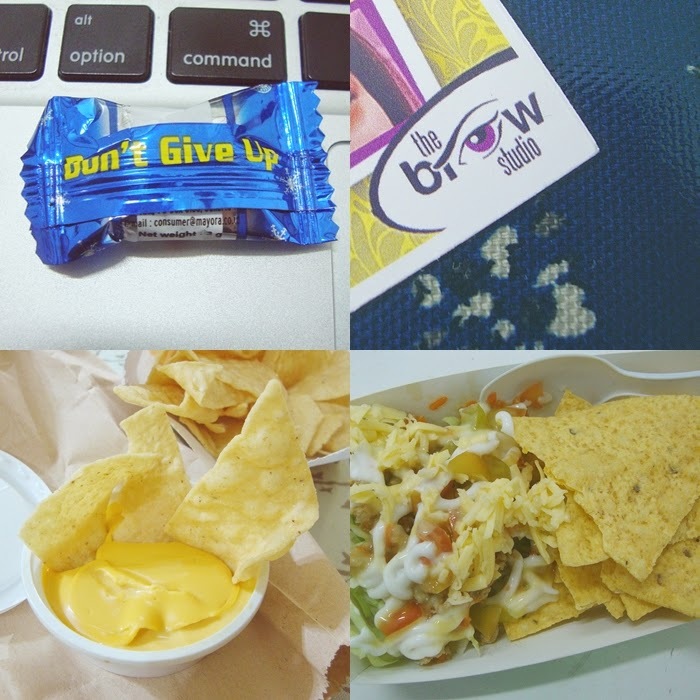 Setting aside my shallow and personal rants, here are the few beautiful things that made my week. Caliburger!!! Prior to meeting my friend T, I searched for reviews about this local franchise. I felt disappointed because most of the articles I encountered posted negative evaluations. Most of the complaints were centered on the limited size, servings and taste of the beef patties. One blogger even said it's like paying for an expensive McDonald's cheeseburger. 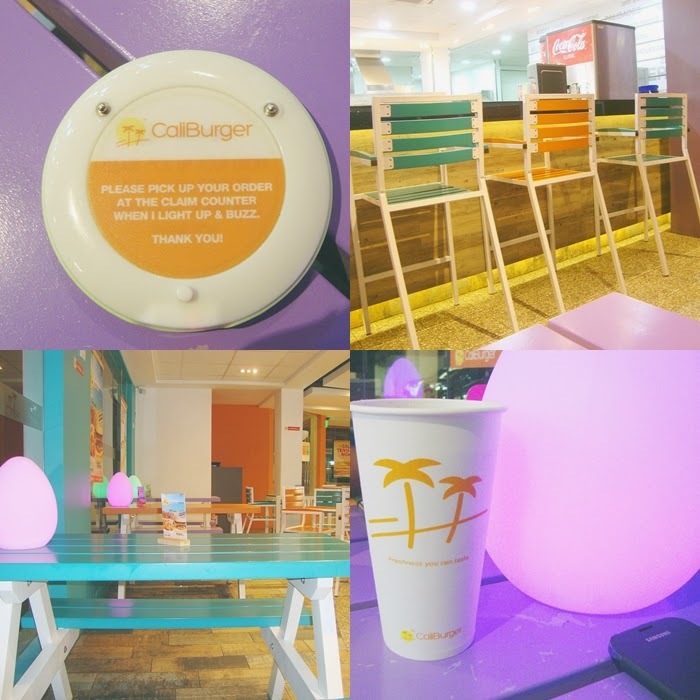 Despite the negative reviews, I was still interested and even excited to try Caliburger. And my verdict .... 4 out of 5 stars. It wasn't as bad and bland as I was expecting. Perhaps all the negative reviews conditioned me to lower my expectations. But in the end, it wasn't really disappointing. I ordered the best seller, cheeseburger with bacon and special sauce. The flavor was not too overwhelming. Minus the location, this will definitely be not my last meal from Caliburger. 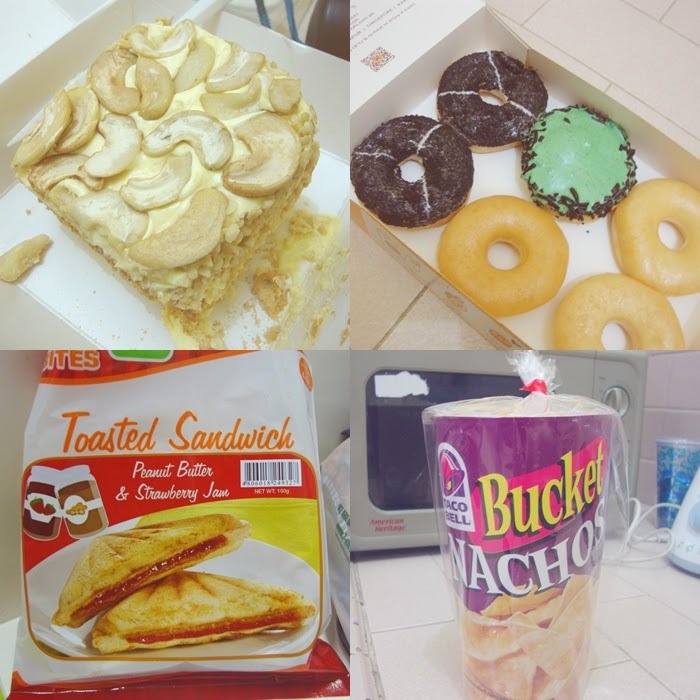 Thanks for the treat dearest friend T! Treats for the feet - My Friday trip to Watson was the culprit. I was only planning to buy a bottle of hair serum. Everything changed when I saw the discounted items rack. And what do you expect from someone who has a very low EQ? 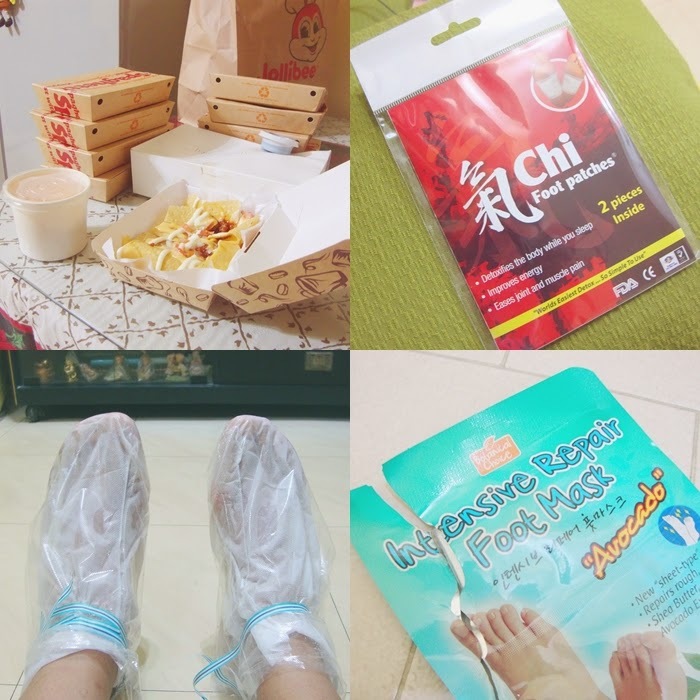 Haha I ended up buying these foot patches, which I first encountered from the cute and dainty Theresa, and a pack of Purederm's foot mask. I'm forever clumsy! 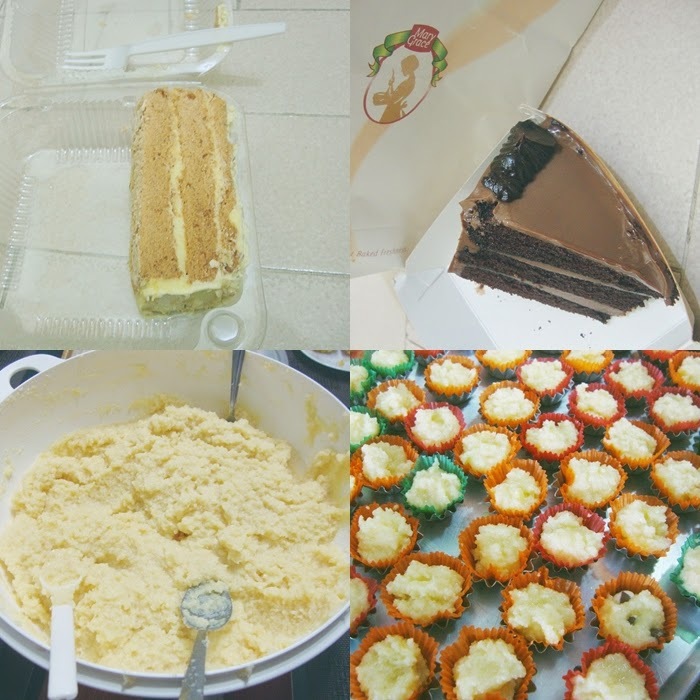 - Sans rival from Highlands Coffee and Truffle Cake from Mary Grace, almost perfect if my clumsiness didn't ruin the frosting and icing. Baking 101 - And yes, I didn't bake. Haha I was just observing and taking photos. These are coconut muffins or in local parlance, macarons from the neighborhood bakery. Can someone guess the building in the first photo? - Long before SM started regional expansion, this was one of my favorite malls in Cubao. Went to see the castle again - I accompanied my cousins to Chocolate Lover to shop for some baking goodies. Someone in the family is celebrating his birthday today. Happy Birthday S! I'm having trouble with the linky. I'll fix this as soon as I can. I have to admit something. Before purchasing anything online, I search for blogs and websites that offer discount codes for online purchases. There are different several ways to search for discount codes. Let me share the few sources I discovered. The signing up discount is the first and easiest means to secure online discounts. Most shopping sites use this strategy to encourage sign ups and entice first time purchases. If you don't like signing up and filling out those personal information forms, some sites offer vouchers in exchange for subscribing to their newsletters. Customer service experience surveys surprisingly provide discounts too. Although not all shopping sites do this, there are a few that provide discount codes once the consumer completes the survey. Look for blog ambassadors. Bloggers who have significant following and influence are tapped by shopping sites to become brand ambassadors. More often than not, blog ambassadors earn through the number of referrals they can bring to the company. These referral are accounted from the unique discount codes assigned to their sites. My recent discovery led me to websites that provide different FREE discount codes and coupons. I was surprised to learn that there are companies such as Sears who offers exclusive Sears Coupons. Best about everything, these exclusive coupons do not require the lengthy process of signing up, typing your personal information and verifying your email. Everything is readily provided in a click. I'm quite familiar with the prevalence of couponing in US. I once saw a feature in CNN on how some households seriously handle the collection of coupons. There are families who really collect and store tons of actual or printed coupons. It appears too tedious and time consuming for me. I honestly cannot imagine myself devoting hours just to arrange and sort coupons. My answer to this saving mechanism is to go paperless and opt for online coupon codes. No need to collect and keep those printed coupons. All you have to do is to regularly check the website and click the offerings you can find useful. A few reminders though, coupon codes have expiry dates. The coupon you saw today may no longer be seen or valid over the next days. Some coupons are not valid with other offers. Some are limited to a certain geographic area or demands a minimum amount of purchase. So before embracing the excitement of experiencing discount and savings, please double check the provision stated in each coupon. I have the license to sleep late today because we don't have work tomorrow morning. We are required to attend a Eucharistic Celebration outside the workplace in lieu of our morning work. Over the last years, I always look forward to this October tradition because I usually eat out with my dearest friend T after the mass. 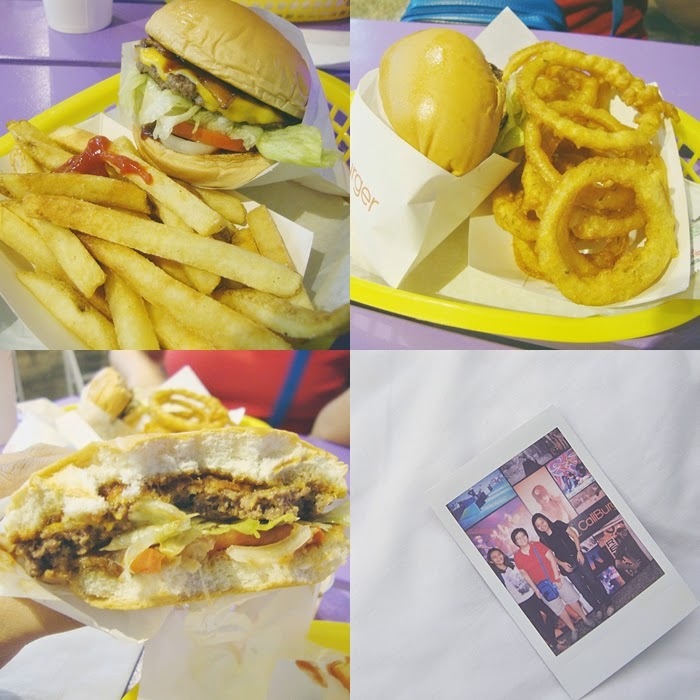 To be honest, I'm more excited with our food trip than the absence of work. :) This year, the tradition will be a bit sad for me. My dearest friend already transferred to another company early this year. I'm friendless and alone tomorrow. I guess I have to check the nearest and trusted shopping mall and dine in to a restaurant that can satisfy my mood cravings. If sadness will continuously attack me, I might console myself with a new pair of shoes, blouse or pants. The reason why I'm blogging tonight is not attributed to this loneliness. 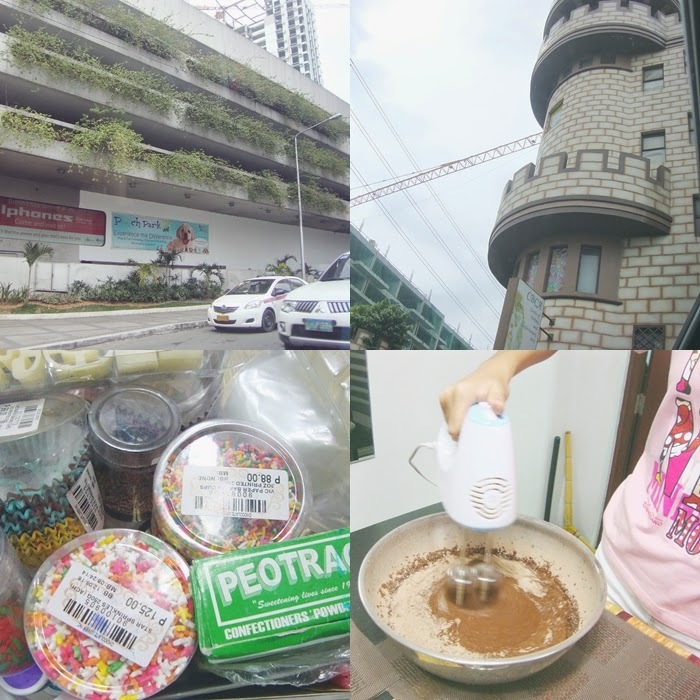 My intention is to highlight the recent experience I had with a major project at the workplace, which I blogged here. 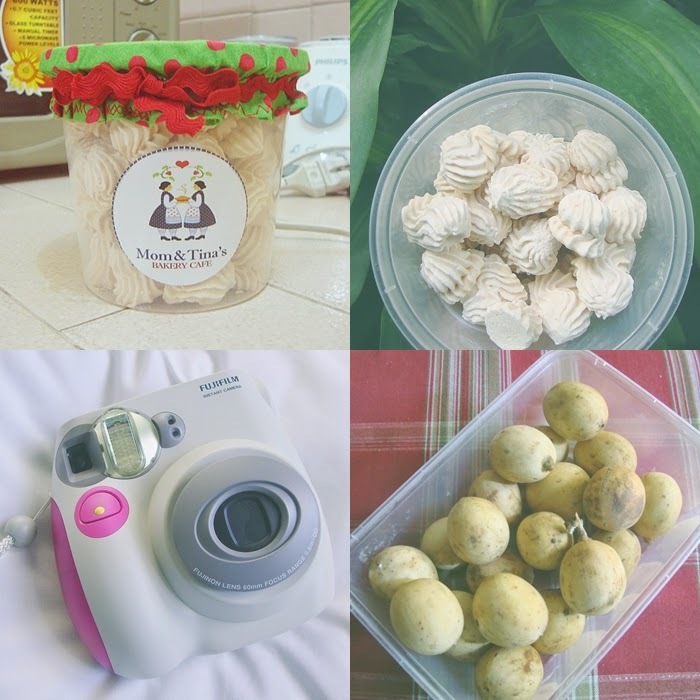 Incidentally, I realized that it was still last June when I last updated my 30 Things blogging series. I already missed two going three months. How can I catch up if I only have less than 3 months? Nevertheless, let's see if I can complete the entire series before my next birthday arrives. The Major Project @ 30 - Me and my Boss spearheaded and prepared all the critical requirement for this project. The documents were already submitted and over the last months, we were praying that we will be included in the final leg of the assessment. True enough, we were granted with the chance. The actual assessment date already happened last month. 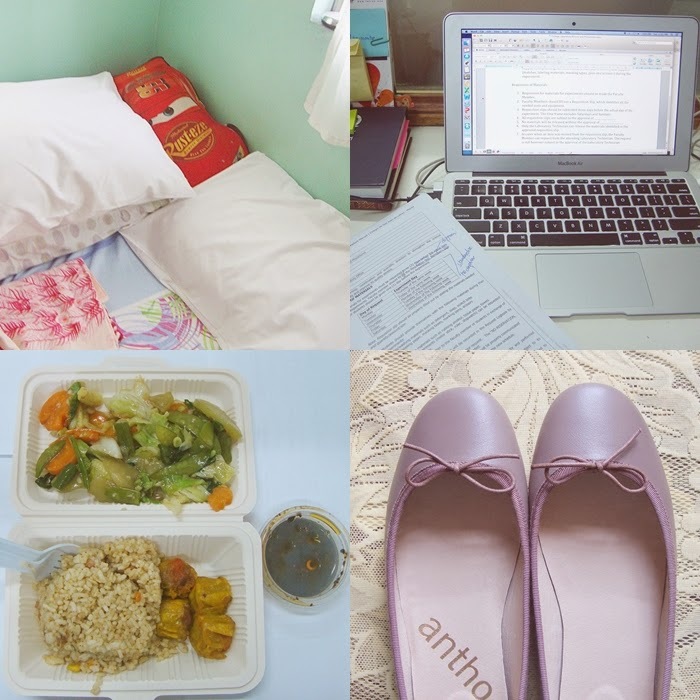 The experience with the three-day assessment led me to another item in my blogging list. I cannot do everything. Days before the assessors' site visit, work and classes were suspended because of the heavy typhoon. We lost two days of preparation from our very tight schedule. We have colleagues who supported us and unfortunately, there were those who ignored and worst, contradicted our plans. 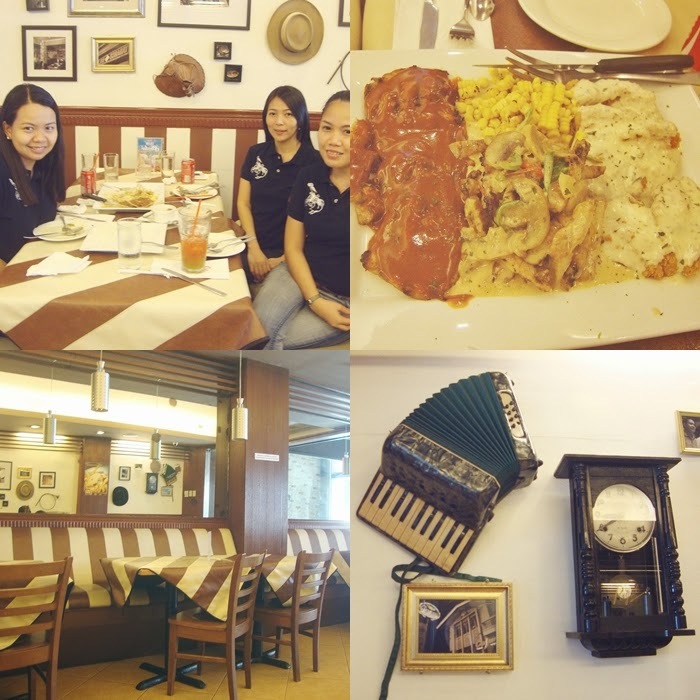 We did the orientations, laid out all the plans, and the least we can expect from other people is to report for work and lend us some records from their office. Unfortunately, our purest intentions and best effort did not suffice. To say that you cannot please other people is even an understatement. We were not demanding for praises and appreciation. We just wanted everyone to accommodate us and the assessors for three days. Oh well, everything is over now. We have done our share. 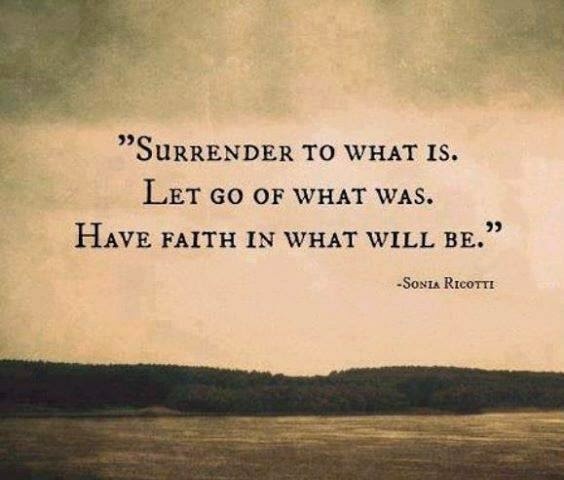 We are leaving everything to the hands of the assessors and the mercy of the Bigger Boss above. I'm reporting for work today. This is just one of those rare Sundays when I had the need to report for work. 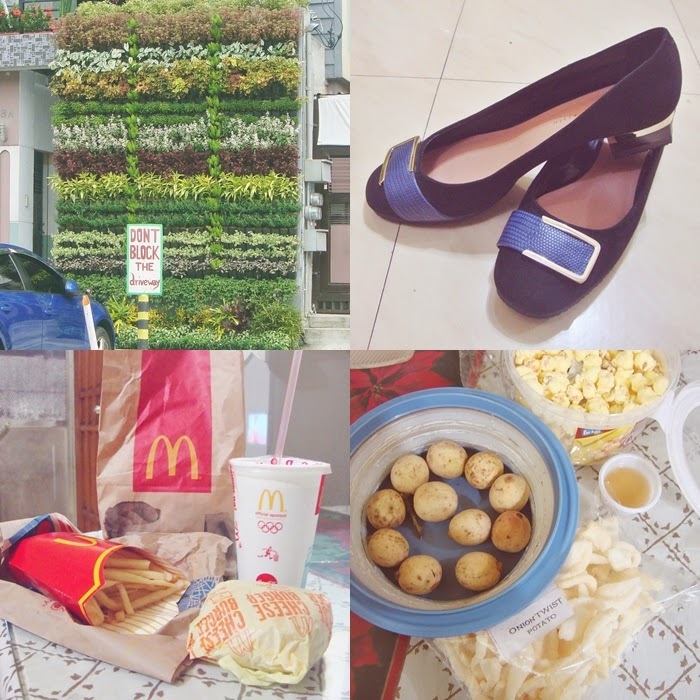 While everyone is savoring the long weekend, the opposite happens for me. Yesterday, I even dropped by the workplace to secure some documents that didn't arrive. Hassle! I wasted money and time and I even have to endure the difficulty of commuting to and from Manila these days. I don't want to pinpoint anyone but Manila is getting worst. I often compare Manila to a cup of instant noodles these days. Just add a few water from the rain and your perfect traffic and flooding disaster recipe is done. Last Friday, I failed to catch the train's last trip because of the heavy traffic and flooding. I walked a lot until I was able to find a jeepney en route to home. The ending, I was able to arrive home the next day. So for today, I'm hoping that work will finish early. I don't want to repeat my experience from that Friday night. Nice message found on a piece of candy :) - Maybe this is another reason to buy Fres Mint candies. The random messages made me happy. Ventured to another first - I used to clean my eye brows on my own. Because of peer pressure :) I was convinced to try eyebrow threading. I was so reluctant the last minute and I keep on reminding the attendant to simply tidy up my rare and scattered brows. The first attempt didn't disappoint. I'm very satisfied!In fact, my eye brows looked like it received additional hair strands. A very neat and tidy eye brows can make a difference. Two types of Nachos - I appreciate both types of nachos in cheese or the classic pork / beef with vegetable slices. It feels and smells like Christmas! 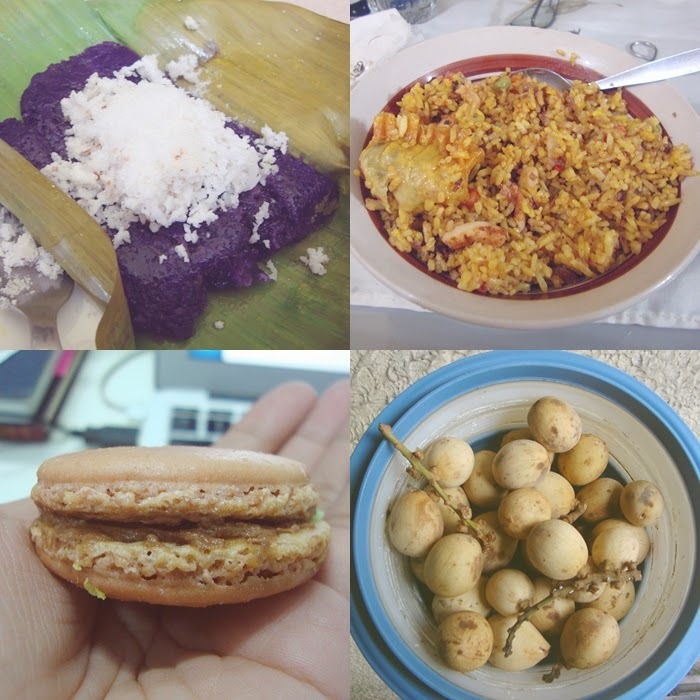 - My Filipino friends can easily explain the violet rice cake topped with grated coconut on the photo. Seafood bagoong (fish sauce) rice - Another reason to love Rice in a Box.